Google predicts that every worker will need to "be fully enabled by technology" by 2020. This means that in just two years businesses will need to give every worker access to the technology they need, when they need it, from where they want. Technology is changing the workplace. But we ain't seen nothin' yet. Google predicts that every worker will need to "be fully enabled by technology" by 2020. This means that in just two years businesses will need to give every single employee access to the technology they need, whenever they need it, from wherever they want. We're a long way from that now. According to Gartner research, many IT teams are rolling out technology but have no clear strategy or alignment with a larger business goal. Plan the rollout. Do the rollout. Job done. On to the next one. But this is not the right way to create digital change. That's because not having a digital strategy to tie all your rollouts together can cause a bunch of problems. Think siloed platforms (which make it tricky for employees to collaborate), difficulty measuring the impact of tech on the business, and poor user adoption. To meet the needs of an ever-connected workforce and stay on top of competitors, businesses must implement a digital workplace — a place where employees easily collaborate and communicate, where process enables them to be more effective, and where technology helps them innovate. 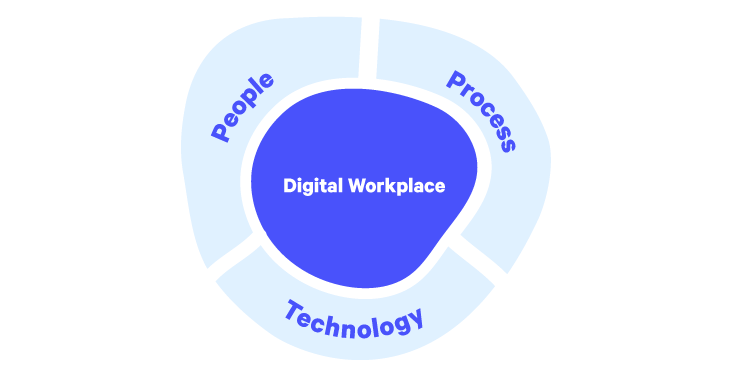 People, process, and technology are the three ingredients for creating a rock-solid digital workplace. There's a lot of confusion about what the digital workplace is. So, let’s first get that straight. A digital workplace isn't an intranet 3.0. And it's much more than a company where employees use all the best new enterprise technology or work exclusively online. "The digital workplace is more than tools, technology or a single technical setting you turn on in your organization. It's a cultural change that enables people to collaborate and be more efficient and productive." In short, the digital workplace is an ideal future work environment where technology and business processes help employees become engaged, productive, and have a big impact on the business. Ideally, a digital workplace team — a combo of IT, HR, and business leaders — will drive a company's digital transformation. This includes creating a clear strategy that sets out clear objectives, the strategies to reach these objectives, and how to improve the digital workplace environment continuously. Still confused? The following video explains the concept really simply. Information technology has transformed the way employees connect, collaborate, and communicate. Only 30 years ago, employees were communicating over the phone or even fax. There was no such thing as email or chat. To keep employees engaged, businesses have no choice but to adapt to employees' evolving expectations and behavior. The last thing a business wants is to lose its best talent to competitors that offer a better experience. Rolling out technology without a good understanding of the wants and needs of the people that will be using it is a recipe for poor user adoption rates. There's little more frustrating than using technology that doesn't really help to get the job done. Poorly adapted tech can create unnecessary steps and add to the workload. To optimize your chances of a successful rollout, first, understand your users' needs and, then, choose technology based on what you learn. Think people first, not technology first. One employee uses maladapted tech that slows them down and prevents them meeting their deadlines. Another employee works with tech that automates certain processes so they can get stuff done more rapidly. It's no mystery which one creates more value for the business. It's a simple concept that isn't practiced enough. When businesses give employees the resources that will make their jobs easier, employees will be more productive, and businesses will get better results. This starts with listening to what your employees want. A digital workplace understands how employees work and how they want to work, and gives them the tools, knowledge, and working environment they expect and need. Creating a digital workplace can help employees thrive, contribute to important business decisions, and have a much bigger impact on the business. The answer isn't as simple as deploying Slack and expecting miracles to happen. You finish writing a report due tomorrow. You want input from your team so you email them each a copy. They add suggestions and comments to the document and each send you their updated version. You end up with seven versions of the same document and work overtime to put all the changes in your original document. You'd rather have spent that time at the bar. This is an example of a broken process. Even now, in the fast-paced digital age, many organizations deploy old-school, one-size-fits-all processes that slow down productivity. It goes something like this: the people at the top create a process model for the whole company. They roll it out across departments and wait for the magic to happen. But this story ends badly. Businesses want results but are shooting themselves in the foot. By enforcing generic processes on employees, they, quite frankly, end up hacking off their employees. From there, it's a downward spiral. Employees become demotivated, less productive, many jump ship. You wrote your report in a document in an online collaboration platform. You shared the link with your colleagues. You reviewed all the changes and comments they made in the same document, swiftly sent your final version by end of business. And you hit the bar with your friends. In the digital workplace, the digital workplace team creates processes based on employees' working behavior to create the best possible employee experience. Using the right processes, employees can cut out pesky, time-wasting tasks and get stuff done more efficiently, and businesses will see better results in less time. To get there, a digital workplace team must start by understanding which processes aren't working and those that could be better. Then, the team needs to figure out which processes can help their employees reach their goals more quickly. This is where the diverse expertise of a digital workplace strategy comes in. HR has a close relationship with employees and will identify any processes that need to be worked on. Business leaders should set the digital workplace goals and make sure that any new processes help achieve these goals. IT will propose technical methods or solutions that make processes more efficient and adapted to employee needs and business goals, like automation strategies and technology. All these players should work together to create and put in place agile and collaborative processes that support modern employees' working behavior. It's a hard truth that few technology deployments are aligned with larger business goals. Instead, rollouts often have their own objectives, for example: "we will roll this application out to 100 users" or "we will complete this rollout by the end of the month." While shooting for smaller goals sometimes makes sense, lack of alignment with business goals makes measuring the impact of technology rollouts on the business tricky. This means that many businesses don't know which initiatives bring real value. No surprise, then, that users often find new technology frustrating rather than helpful and use it at a bare minimum, if at all. A lose-lose kinda situation for employees and the business. That's where the digital workplace comes in. In a successful digital workplace, employees have access to the technology they need at any time, just as they do in their personal lives. An employee can collaborate in the same project as their colleagues on the other side of the world. They can communicate with colleagues via instant messaging or video apps. Tech empowers employees by giving them the flexibility to work how, when, and where they want. "We need a more broad and unified view of how we deploy technology and business apps to move the business forward." Your digital workplace plan must, first, clearly map out your organization’s priorities. Second, it must explain the methods your digital workplace team will use to identify technology that will help to achieve these priorities and the strategy for deploying this technology. This way, you can make sure that every technology you deploy has a measurable, positive impact on employees and business outcomes. A sure-fire way to keep the company’s employees and the big boss happy. Once your organization's priorities are clear, your digital workplace team can think about which technology could help propel the business towards its goals. Deloitte created a handy breakdown that groups workplace technology into eight different digital categories so you can quickly figure out which technology type you need to prioritize. If one of your digital workplace goals is to improve collaboration, you may think about rolling out wikis or web conferencing, for example. But always keep top of mind that your choice should directly address the needs of your company's employees. No-one's kidding themselves — transitioning to the digital workplace won't be a piece of cake. For the digital workplace to be a success, everyone in a business — not only IT — must be on board and aligned with the digital workplace strategy, and play their part to get there. The hardest part may be fundamentally changing the way people in an organization think about the workplace – shifting the old mindset to the unknown. But a solid roadmap that sets out the way for the three main ingredients of your digital workplace — your employees, businesses processes, and technology — will surely help you get there.